H.B. 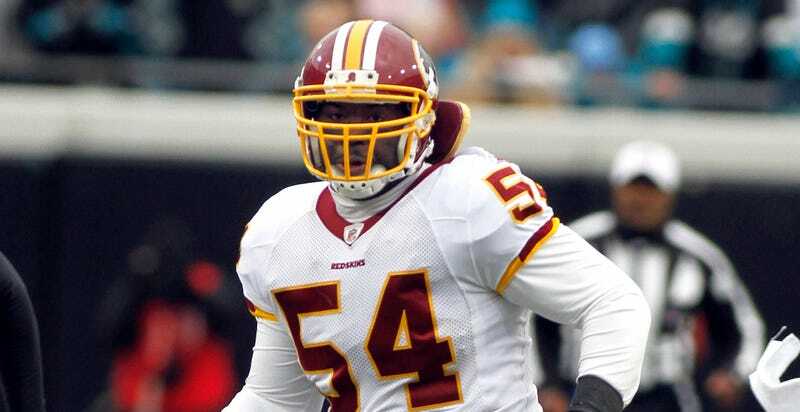 Blades was a sixth-round pick from Pittsburgh who played four seasons for Washington as a linebacker. The team cut him in 2011, and formally paid him $40,000 in severance pay in September 2012. However, they also paid out that same sum a few months later, and they’ve been fighting in court ever since to recoup their losses. On Thursday, they filed a lawsuit against Blades in U.S. District Court to attempt to get back the doubled payment. The suit, which TMZ Sports first reported on, shows that the team asked Blades for the money back in January 2014, then filed a formal grievance with the NFLPA the next month, and took Blades to arbitration later that year. He agreed to pay back $20,658, which was all that was left of the payment after taxes and withholdings. The team agreed to terms, but stipulated that if Blades didn’t pay up promptly, he’d be instead liable for the entire $40,000, essentially levying a $20,000 fine for not immediately paying them back. By March of last year, Blades had not paid up and his payment then doubled. By Thursday, he had still not given Washington its money back, so they filed this lawsuit to force him to. If they win, they’ll force Blades to pay back the original double severance, as well as cover the team’s legal fees. Blades has been working as an assistant football coach in the south, per the Washington Post. He has yet to comment on the suit, and, as the Post notes, does not appear to have a lawyer representing him. Dan Snyder is worth $2.1 billion, and his team is worth almost $3 billion. You can read the full suit here, or below.